Selection of great properties is a beneficial deal for high-returns on the long run property investments in Gurgaon. The real estate market here has different types of options. Both the commercial and residential properties are in huge demands here due to the exceptional growth and development in Gurgaon. Especially the residential projects in Gurgaon are in great demands amongst the luxury homebuyers. Buyers searching for top-quality apartment complexes and high-end residential developments are available in abundance. Most of these buyers are expatriates who have entered here to join the leading MNCs which are providing here unlimited employment opportunities. The jobs offered by these renowned organizations are of the best quality and high profile and is the prime reason for the buyers here have the required potential and capability to invest good amounts for premium housing. Sector 88A, an emerging destination for quality housing has a great range of quality projects which are perfect in terms of modern living and sophisticated lifestyle. A township collecting huge fame and overwhelming responses is the ultimate destination of quality housing in Gurgaon. The stylish and charming, Godrej Oasis is completely ready to serve you with its outstanding modern comforts and superb features. The stylish modern apartments are available here in the configurations of 1, 2, 2.5 and 3.5 BHKs. All these premium units have split ACs, glorious interiors and sophisticated designs. The magnificent RCC framed structure here have meticulous exteriors and provide magnificent views of incredible garden areas spread 1.5 acres of prime land. Godrej Oasis Gurgaon is very close to Hero Honda Chowk, CPR and Dwarka Expressway. It is well-connected to IGI Airport, NH 8 and Pataudi Road. 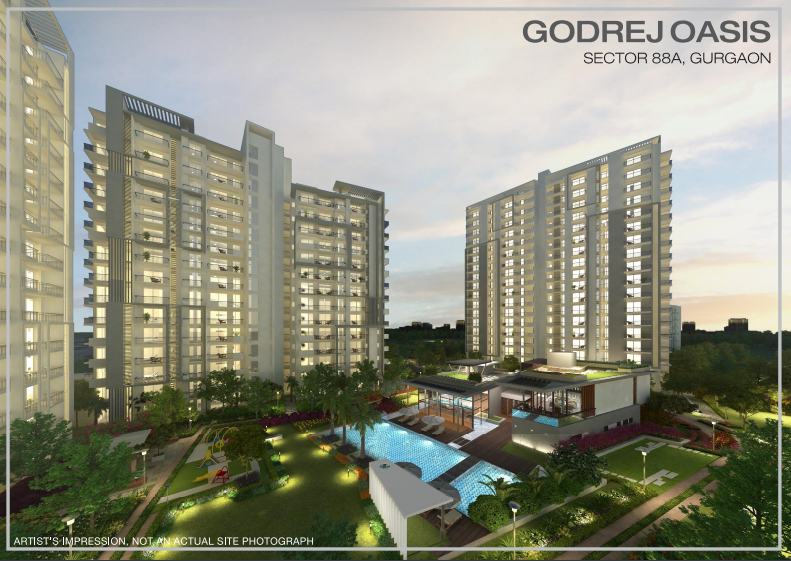 Supreme Luxuries in Godrej Oasis Sector 88A are the best attraction of this property and the major features include a waiting lounge, intercom facility, clubhouse, multipurpose hall, power backup, landscaped garden, meditation center, kids’ play area etc. Prices set here for the sale of apartments range from Rs. 64 lakhs to Rs. 1.28 crores.